The sixth beta of Apple’s iOS 12.2 was released yesterday, this is most likely the last version of the software before it general release. 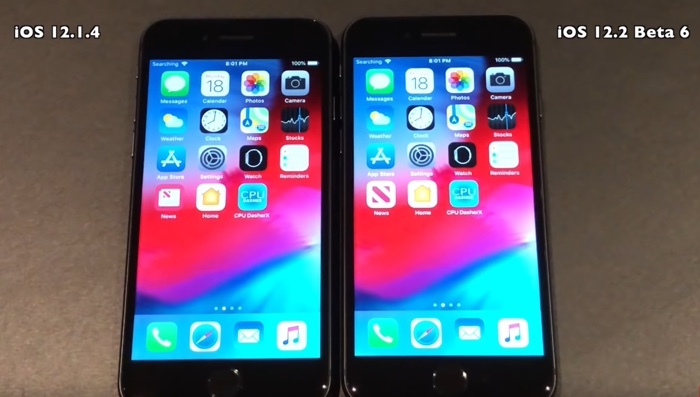 Now we have some speed test videos of iOS 12.2 Beta 6 vs iOS 12.1.4. In the videos below we get to see the new iOS 12.2 and iOS 12.1.4 run on the iPhone 5S, iPhone 6, iPhone 6S, iPhone 7 and iPhone 8, lets see if there are any speed improvements. As we can see from the videos there were some minor speed improvements in the boot up times of some devices. There were no major speed improvements in the apps, so it looks like overall no major speed improvements in the new iOS 12.2. software. Apple is holding a press conference next week on the 25th of March for its new Apple TV streaming service and we are expecting the new iOS 12.2 software to be released then.